Try out one of our amazing Escape rooms for 15% less! Hurry up limited time offer only. 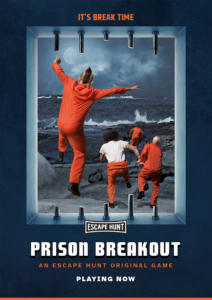 Escape the deadly prison or risk a fate unknown. It’s the mid-1970s and you wake up to find yourself locked in a prison cell. Every 60-minutes the guards drag one prisoner away. So far, none have returned. Your only option is to attempt a daring prison escape or risk a fate unknown. 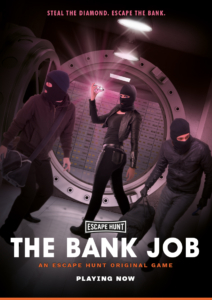 Steal the diamond and escape the bank. You are part of an infamous jewel thief gang who is about to steal the Pink Star Diamond from the Bank of Dubai. You’ve disabled the bank’s surveillance system. You now have 60-minutes to steal the diamond and escape before the surveillance system fully reboots. 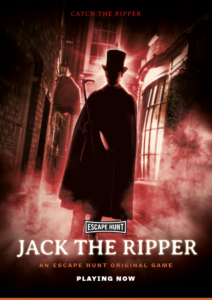 Unlock the true identity of Jack the Ripper. You travel back in time to 1888, where you have been monitoring the White Chapel Murderer for weeks, known as The Ripper. You know his whereabouts and his movements, but you don’t yet have any evidence. He leaves his house and you have 60-minutes to find the evidence you need and get out… before he returns! BEAT THE CLOCK AND BREAK OUT! You've just one hour of pulse-racing excitement to win your freedom - if you can!